The 2013-14 season was about personal growth off the court. The girls formed special bonds and relationships with each other as they overcame various trials and struggles. 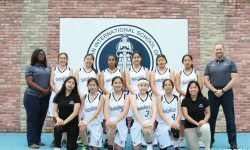 Through these trials the girls improved as basketball players and had many successes. Hana Ikeda led the team in points and steals. Suzy Kim led the team in rebounds and was a dominant player in the key. The future looks bright as the girls are only losing one senior and have strong junior and sophomore classes. Juhee and Hana became the twin towers using their height disadvantage to create many defensive steals leading to fast break points. Suzy Kim led the team in rebounds and was a dominant player in the key.